This was originally posted in 2004 but given my recent posts on climbing, I thought I’d give a bit of context to how climbing leaked out into other parts of my life. In the old days, a long time ago (1970-1980) I was a potter and made a living selling wares and teaching ceramics. Most of the photos of my work are in slide form and I have not gotten around to scanning them. Here are a few that I have. This is a small stoneware “jug” that had a “temoku” glaze on it and was then fired in a wood-fired kiln with salt tossed in (salt fired). At the time I was doing this work I was also getting seriously into rock climbing and I loved all the perlon rope and knots and such. So, I experimented with combining old and new. This is a top view of a similar piece, different way of securing the cork. 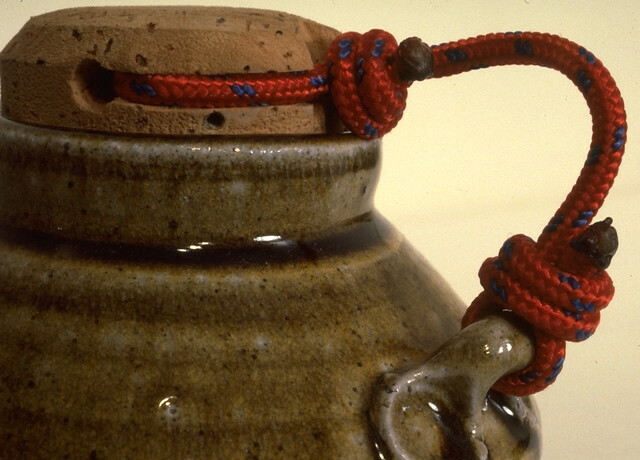 The knot on the underside of the lug slides so that the loop on top loosens and tightens to hold the cork in. This piece is raku fired: quickly at low temperature. Being the outdoor type I was eating a lot of dried fruit at the time and had built a fruit dryer to make my own. This new material came out called Gortex and so, I bought a piece and put it on a pot, with some fruit inside, thinking that the way it dealt with water would allow the fruit to dry without spoiling (water vapor would go out, but no air would come in). It didn’t’ quite work that way but I liked the colors. 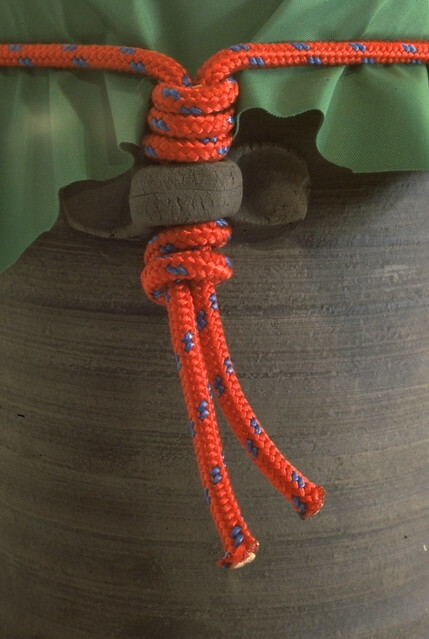 This piece also uses a slider knot to tighten and loosen the perlon cord.